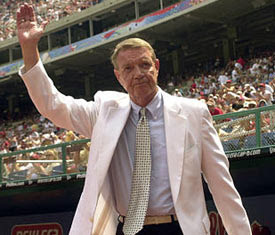 Legendary Phillies broadcaster, Harry Kalas, passed away today at the age of 73. We are all so sad to hear this news. I grew up with his voice announcing the Phillies games. Bob and I even joked that Carter would think Harry was his dad because we listened to him announce every Phillies game last year while I was pregnant. I just want to cry. At least Harry got to see the Phils win the World Series.